Suitable for all kinds of dates(palm date, red date), hawthorn processing, can produce dried date, dry fresh date, date powder, date juice, juice concentrate. This production line is mainly composed of air blower, sorter, grading machine, air drier,nuclear machine, smasher, extraction tank, clarification machine, sterilizer and filler. This production line design features advanced design idea, high degree of automation; Main equipments are all made of high quality food grade stainless steel, accords with the hygienic requirements of food processing. * Capacity varies from 3 tons/day to 500 tons/day. * Able to fruit with similar processing characteristics such as palm date, red date, hawthorn. * After cleaning, drying, classification can be processed into plastic bags of dried fruit, or be processed into doypack after crushing and sieving. * Can be made into juice and concentrated juice after extraction,clarification machine, pulping, enzymatic hydrolysis, separation, concentration and sterilization. * The whole production process controlled by PLC, electrical components are all imported products, as a result to save labor and greatly reduce operating technical difficulties. 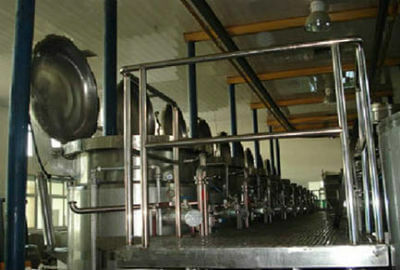 * Low temperature vacuum concentration, guarantees the nutrients and flavor, and greatly save energy. * Tubular sterilization and aseptic filling to guarantee the product aseptic condition.